Lucky cats : the Mystery revealed! Have you met Nincha? Nincha is our company mascot and will also be your tutor in Ninchanese. As you may have seen, Nincha is no ordinary cat: it’s a lucky cat. So this week, we wanted to tell you more about where this cute and awesome creature came from, what it means… That or we were just looking for an excuse to show you a bunch of cuddly lucky cats. You decide. And without any further ado, let’s get lucky! A lucky cat is called a 招财猫 in Chinese. It originates from Japan but was very quickly adopted as a mascot in China as well. You’re likely to see lucky cat figurines in restaurants, businesses, houses… or even in shrines in Japan, apparently. Their name, both in English and in Chinese, give a pretty clear idea of what lucky cats are used for: to bring you luck or happiness! 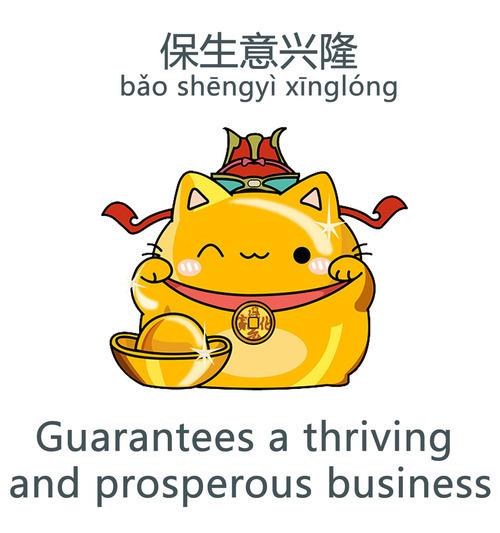 In Chinese, a 招财猫 is literally a cat (猫) who’s inviting wealth (招财). To your house. Nice. Put your hands up for luck! A lucky cat’s first tool to bring luck or good fortune to its owners is its raised paws. 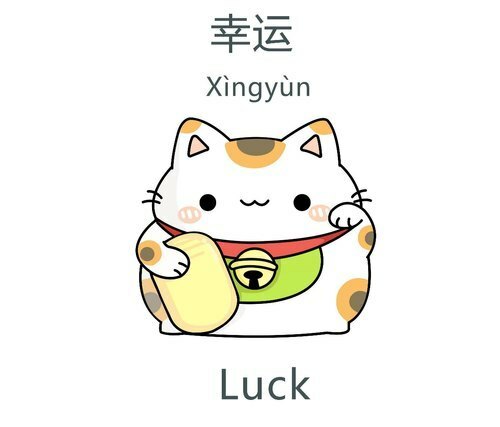 If its left paw is up, the lucky cat’s working on happiness and luck. Right paw? Money. And if the lucky creature has its two paws up, bingo! It’s supposed to bring you both money and luck. Given the current times, apparently cats with double raised cats are in high demand! Then, look at a lucky cat’s eyes, their second weapon of mass-luck: closed eyes: it will help with a fortune nearby (short-term). Eyes open: it will help with a more distant fortune (long-term). A lucky cat’s robe color is also of importance: it determines the kind of good they’re likely to do to you. The classic lucky cat is a white cat, like Nincha. But the white lucky cat isn’t the only type of lucky cat that exists. Yup, you read right: there are actually 8 different types of lucky cats Nincha can play with. White lucky cats bring you good luck. 白猫代表幸运. 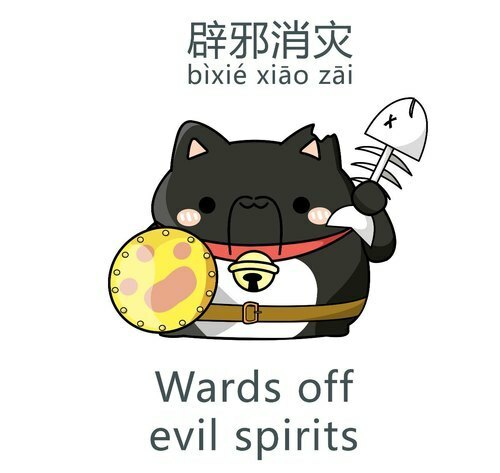 Black lucky cats ward off evil and calamities. 黑猫能辟邪消灾。 Hēi māo néng bìxié xiāo zāi. You therefore tend to see them a lot in some places. Gold colored cats symbolize wealth and prosperity. They help guarantee a thriving and prosperous business. 金猫是财运，保生意兴隆。Jīnsè shì cáiyùn, bǎo shēngyì xīnglóng. This is why you often see a golden lucky cat in Chinese restaurants. 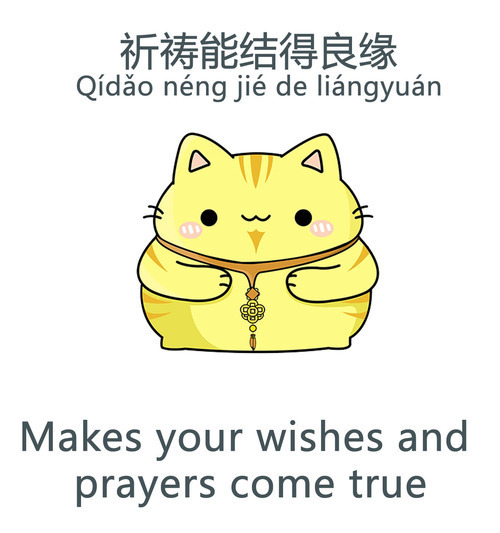 Yellow lucky cats bring you good karma to help improve your relationships (business, family,…) and help your wishes come true. 黄猫是祈祷能结得良缘。Huáng māo shì qídǎo néng jié de liángyuán. 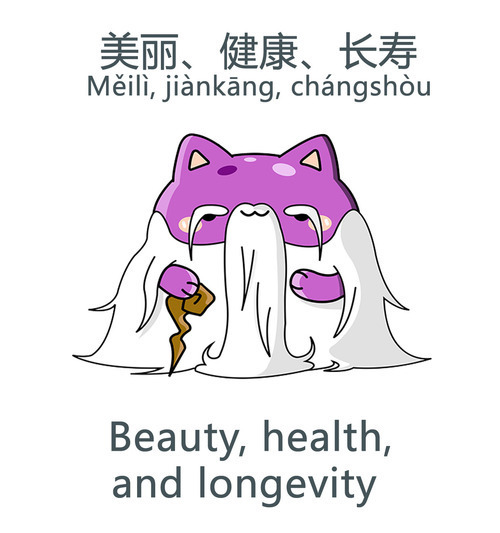 Purple lucky cats symbolize beauty and health and longevity. 紫色是美丽、健康、长寿的意思。Zǐsè shì měilì, jiànkāng, chángshòu de yìsi. 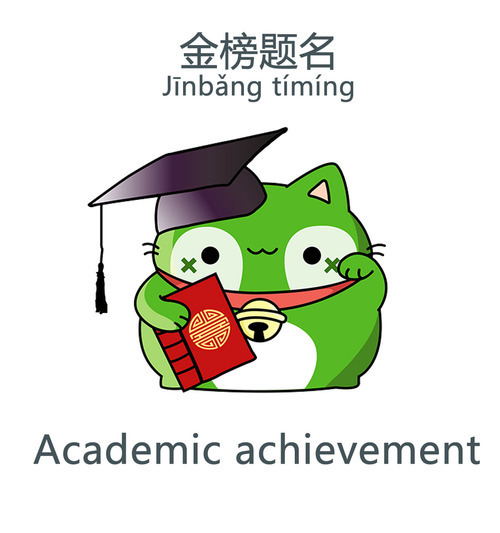 Green lucky cats not only wish upon the owner academic achievement. They also dole out extra servings of happiness and peace. 绿色是幸福和安定；也是希望能金榜题名。Lǜsè shì xìngfú hé āndìng; lǜsè shì xīwàng néng jīnbǎng tímíng. 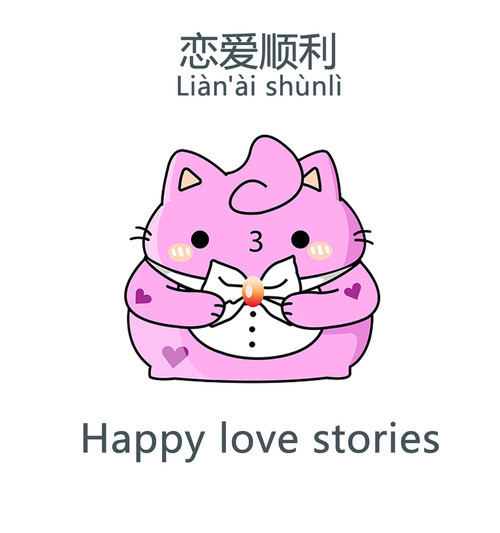 Lastly, pink lucky cats, naturally (as pink is associated with love in China) represent love, relationships and romance. They convey the hope your love story goes well. 粉色就是希望恋爱顺利。Fěnsè jiùshì xīwàng liàn’ài shùnlì. What’s also fun about lucky cats is that the props they carry have different meanings. Like bonus luck. A gold bell, like the one Nincha is wearing, brings extra luck and happiness. And eggplant, drawn on its belly, symbolizes love and good luck. Pretty good, huh? Peaches will help you achieve your dreams. Accompanying animals like a goldfish, a turtle or a crane, also bring extra luck or health… So pick your favorite prop, and play dress up with your lucky cat! Which is your favorite lucky cat? Hi Katt, glad to hear you enjoyed the article and it answered some of your questions! 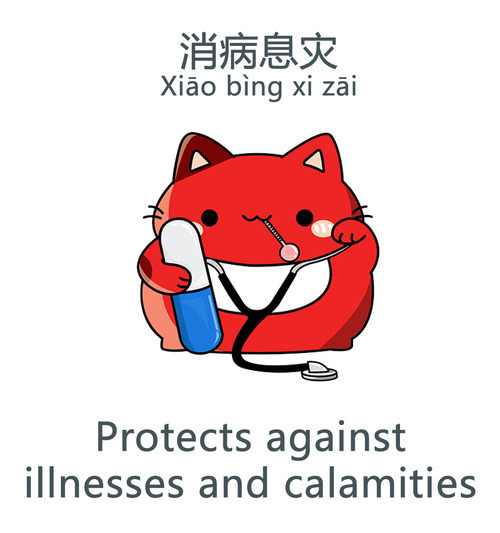 Cute lucky cat you got there 🙂 The inglots represent wealth, that’s why it’s quite common to see them with lucky cats, which are traditional associated with luck and wealth. As for where to place your lucky cat, my answer would be to put it where you want! Is there a place where you want to be brought luck more than others? That could be a good spot!